The faculty of Arts and Design, in collaboration with the Arabic Language Centre, held two workshops for Chinese students on 21 and 28 November and 5 December,2018. The first workshop, entitled as “Wrapping and Crafting Canson Paper”, was about learning students to make three artworks with strips of coloured Canson paper. The workshop was given by Associate Prof. Nahla El Deeb, the acting head of the Fashion Design Department. Meanwhile, the second workshop was concerned about Arabic calligraphy: techniques of writing Arabic letters, adding diacritic marks, Arabic calligraphic cursive styles and the kind of tools used in this activity. 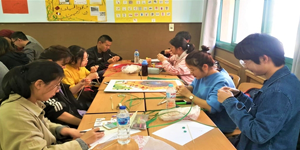 The aim of this workshop was to adopt an innovative approach to teaching Arabic language to Chinese students and contributing towards developing their skills in this respect whether through studying colours or Arabic calligraphy. The workshop was given by Dr. Shaimaa Kodair, a Lecturer at the Graphics Department.